I didn't have much planned for this day. an illustrator/designer who I've known for a while. He was in a rush to get to the convention center to meet up with Dai Sato and others. They worked on a few projects together, I think. The bicycle cab ride was pretty fun. When I got to the convention center, I went in the exhibit hall for the first time this year. to the Tekken Blood Vengeance screening from Bandai Ent. Then I went to go see Yen Press, since I missed them the night before. On the way, I managed to pick up a Phineas & Herb knapsack. I didn't get the one I wanted, so I spent the whole day finding someone to trade with. I wanted to see T from Yen Press because I had some goodies for her. Well, it was just to market the Hakuoki game to her, since I knew she would like it. I then went to hang out with my friend F.
We got to catch up, which was nice. 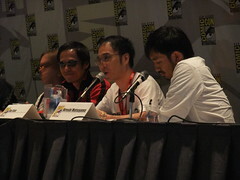 Then I went to the Namco Bandai panel to see Dai Sato, since I told him I would go. When I got to the room...the line was huuuuuge!! So once again, I had to use my connections to get in. 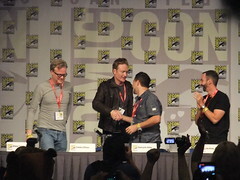 And that was it for me for Comic-Con 2011. I spent most of the time in the panel rooms and networking. But I had a lot of fun!! 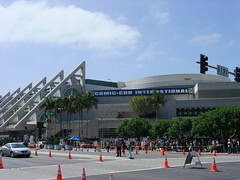 See you next year, Comic-Con! 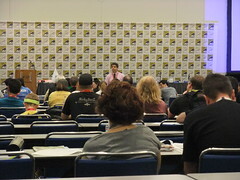 This was the busiest day at Comic-Con, since I had to do a lot of business stuff. 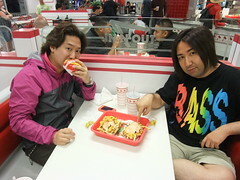 I went to the JManga panel to meet up with R, one of the JManga people. He introduced me to the S-san, the guy in charge of JManga. 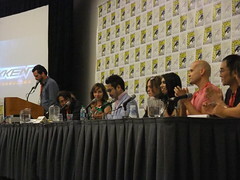 The panel was VERY scripted and I found that funny. But I hope everyone is excited about it. 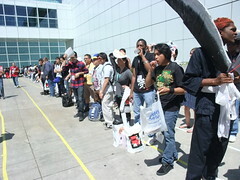 After the JManga panel, my friend F and I went to line up to get into Room 6BCF. 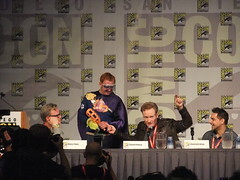 We wanted to get into the Green Lantern panel. 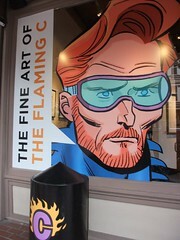 And I would only do it out of love for Conan O'Brien. We got in for the Legendary Pictures panel, which was cool because it was something I wanted to check out. And we got copies of Mass Effect 2 out of it, too! 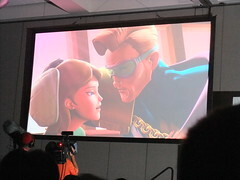 After a brief Green Lantern panel, they introduced the main event. 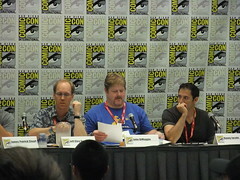 First, a clip of The Flaming C.
It was a fun, fun panel. 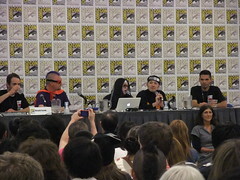 Then we went to the Shonen Jump panel, since our friend M was dressed up. 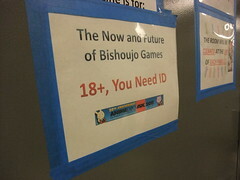 Then I went to the JManga party. I got to meet a bunch of new people as well as catch up with clients who I only see once a year. Served by a couple of cute men. 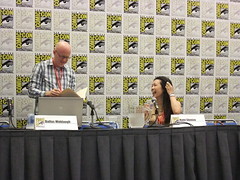 I then rushed to the Bandai Ent panel, where my sister was interpreting for Dai Sato. I caught up with them at the end. 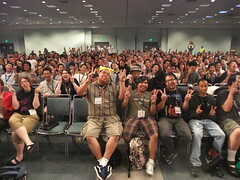 I rushed (again) to get in the Yen Press panel, but it was full. This time, I was too late to use my connections to get in. But too much happened and I don't remember, that's all. I was really, really tired at the end. because I did a lot of business and nothing I could write about. 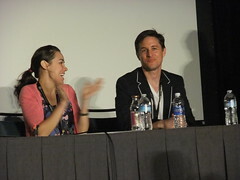 But I'll just post pictures of the panels I went to. I started the day with a low-key panel (no line, not crowded) about laws about copyright. 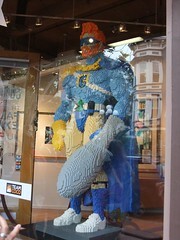 (Part of the Comic-Con Law School series). 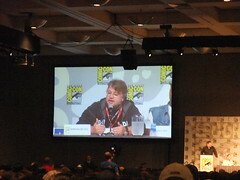 I then went to the Nick & Dreamworks panel. They had various voice actors from Penguins of Madagascar. They did live karaoke, a stage reading, etc. 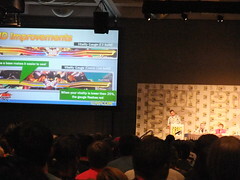 I went to the Street Fighter x Tekken panel, but I was too far back to understand anything. 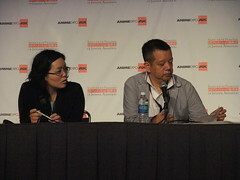 Next was Kodansha USA's panel. and I realized why Love Hina was on such a tight schedule. so we sat and talked for a bit. We then went to CocoMoca. where I saw more industry friends. then left because I had dinner plans with people from Japan. It's a small world here in LA and if you work in the entertainment industry. and half of the condo are people who work in the industry. Anyway, I joined a tennis league this summer. and it was free to join because they needed more people. I scheduled a match with someone in Encino, CA (30 minutes north from West LA). and knew my neighbor's friend D who writes for Warehouse 13! 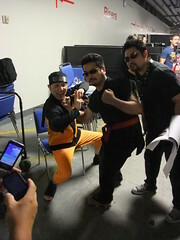 So during the match, we talked a lot about the industry and Comic-Con. She was a great player and very nice, so I hope I can see her again. who was working on Hakuoki with me, had finished translating. She was soooo behind the last time I was at Aksys! while I worked on other projects. And like the turtle in the fable, she surpassed me, the rabbit. I panicked and immediately scheduled to go into work at Aksys Games. Besides, editor B wasn't nearly close to catching up. But still, I felt bad, so I went to finish it. The game is pretty much the same up to Chapter 3. From Chapter 4 it branches on to whatever character you got close with. These are called [character name] routes. I kept getting the "normal" ending. so I didn't feel anything was left out. I like the Hijikata route the least. But only because it was sooooo long and it was torture to finish. Also, I was working on it under pressure to finish fast, so it wasn't as fun. 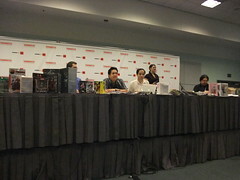 According to interviews by Aksys, the game is coming out early 2012. AND! They have a survey asking the fans what they want to see in the limited edition. Hurry and voice your opinion; it's only up until July 29! Tell them what you want here! so it's a good game to get you interested in that era. Yes, even guys could play this game!! Please check it out when it comes out next year! 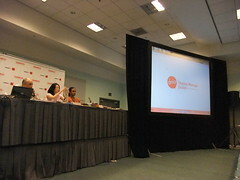 Bandai Entertainment, and Sunrise at the Bandai Entertainment booth. My sister was interpreting for Sunrise...one interview and one panel. so I threw it to my sister. I met the Gundam producer at Sunrise. so I didn't have much to say other than that I worked mostly on Code Geass. 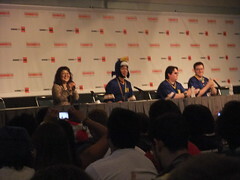 I then went to the NIS America video games panel. My main contact is with their anime division, so I'm not sure why I went. It was pretty fun, though, listening to the localization team. 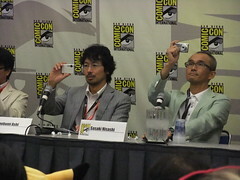 As they spoke, I was comparing them to the Aksys Games localization team. And obviously they say the same kind of things, so it's funny. Got to love those editors...they do a great job! I had a bit of time, so I went to go see my cosplayer/editor friend H.
While getting to where she was, I took some pictures of random cosplayers. 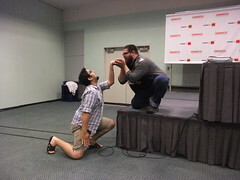 I went to the Gundam Unicorn panel next. and to cheer on my sister as she interpreted. But I had to leave early to go to the Idea Factory panel. I spoke with a boy who was standing in front of me. how many video games he bought so far this year, etc. although at the end I told him I worked in the industry. Again, I wish I had something to give him for answering my questions. Next year, I will remember to have stuff in my bag. When I got inside, I went to go say hi to the Aksys Games people. and if I could interpret for them. I was ready to do it, but fortunately(?) the interpreter showed up. 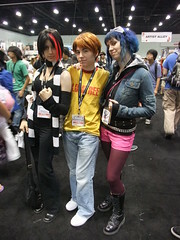 since I escorted them to the exhibitor hall. 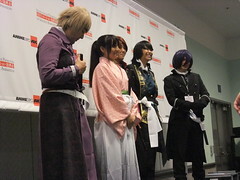 (They were having an autograph session at the Aksys Games booth). 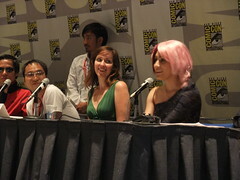 and how they were nervous and worried if what they said at their panels were sufficient for the fans. 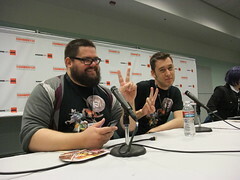 J from Aksys did a great job moderating the panel, and I think it helped them. As expected, I mostly talked to Sugano-san. Hirano-san was very shy and said very little, other than wanting to stop by the restroom. 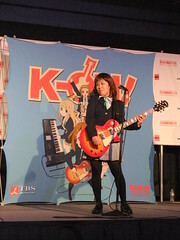 I met up with my sister once again and we headed for the K-ON concert. I wanted to say hi to Stephanie before she performed, because I knew she would be nervous. 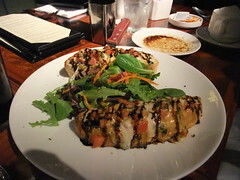 But I had to leave a little before 6p to meet up with my friend F, because we were going to dinner. 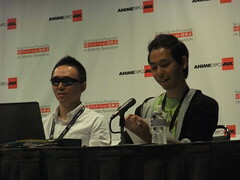 After dinner, I went to the MangaGamer panel to interpret. I did get to ask someone who had a PSP what game he was playing. 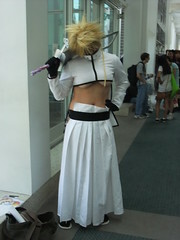 I wanted to ask more, but I was with Fanime staffer T, so I didn't. I forgot to take pictures of Bamboo and Tororo during the panel. And all of this was happening in a really hot room. LA Convention Center turned off the AC! Grr! While interpreting, I had to listen, write, drink water, and fan myself. I did take pictures of the lovely fans! 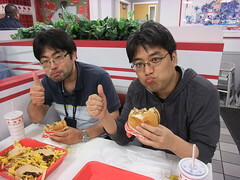 This is them doing the "ahegao double peace," requested by Bamboo. Thanks to my friends F, G, and E for coming to support me! 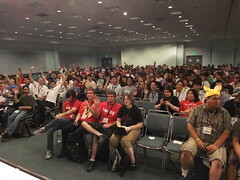 And that's it for Anime Expo 2011! I started the day off hanging out with my friend at the Artist Alley. I wasn't even helping her sell...I'm such a useless friend. 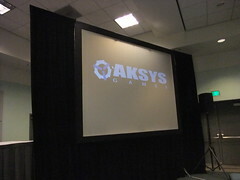 I then headed to the Aksys Games panel. This is Ben and Bo. Ben is one of the great editors at Aksys, and my editor on Hakuoki. Bo is the director of production, and the guy who offers me jobs. which is why I took a lot of pictures because I worked on it. 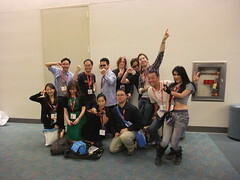 Aksys has really friendly staff, which is why they have fun-loving fans. 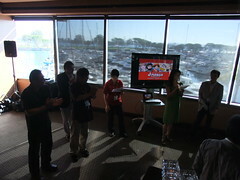 After the Aksys panel was the Anime News Network panel. And I finally got to meet Justin and Zac. They were giving out DVDs and figures for each question asked. 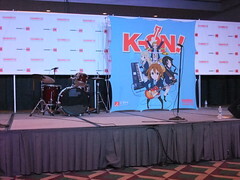 The goods were donated by Funimation and AAA Distribution. 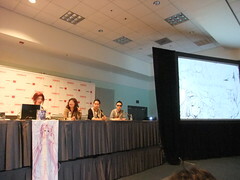 Then I went to the Digital Manga panel. A lot of the things mentioned was stuff I already knew from reading the Manga Bookshelf. I had time until my next panel, so I decided to head back to the South Hall. 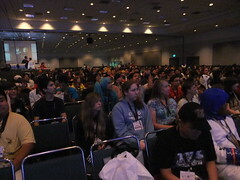 (All the panels are in the West Hall). On the way back, there was a line for a panel for one of the singers. I asked some guys sitting in the sun about it, but they didn't seem to be annoyed. Or maybe they were too dehydrated to complain to me. 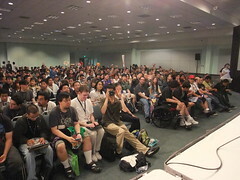 Later in the day I went to the Bandai Entertainment panel. Of course, they had technical problems. 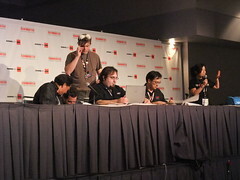 "It's not a Bandai panel unless there are technical problems." 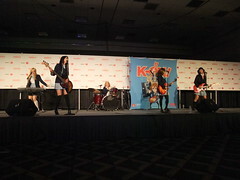 like the K-ON concert and Gundam Unicorn screening. She also got to promote We [Heart] Japan! Bandai Entertainment didn't announce the next project I'm working on for them. So I have to keep quiet about it for now. 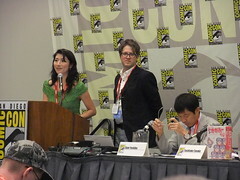 I stayed for the Gundam panel, presented by Sunrise. Bandai Entertainment ever since I started working in the industry. So I got to learn a lot. 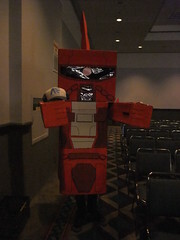 This guy got a hat for dressing up as Zaku. Personally delivered by yours truly. 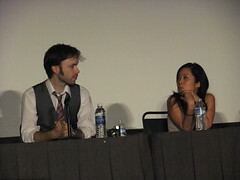 and Stephanie Sheh and Michael Sinterniklaas. 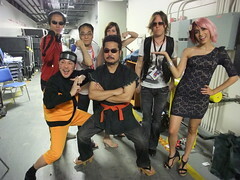 I got to meet the very nice Otakon staff. Maybe a client could hire me to work at their booth. That was it for Day 2. Today I had to go to two conventions. 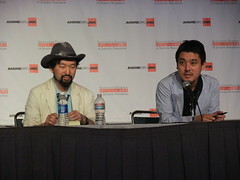 Kenta Sugano and Katsuyuki Hirano of Idea Factory. and I wanted to check it out. 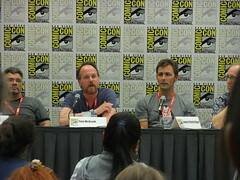 The panel was short because of delays from the OP ceremonies, but it was interesting. I then went to AM2. and I wanted to accompany my sister, who was semi-going for her work for Company BR. I took a bunch of pictures, but they're pretty sad, so I won't put them up. 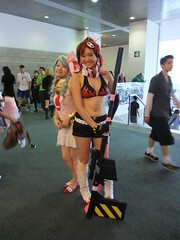 I did interview a group of kids on why they chose to come to AM2 instead of AX. Maybe next year I'll pass out stickers or postcards to kids who are kind enough to answer my questions. I had a short Day 1, because I wanted to rest.